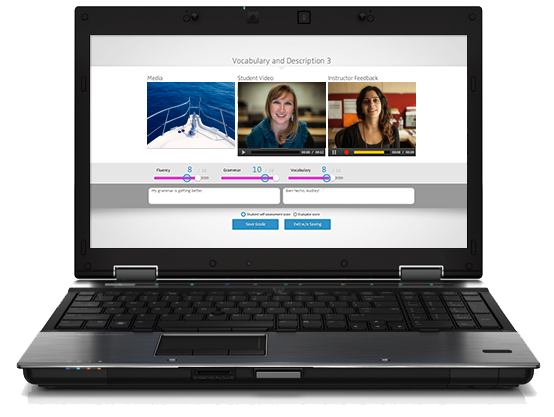 Avenue™ is an innovative e-assessment platform for building custom language tasks to capture, evaluate, archive, and visualize progress of video-based learner performances in any world language classroom. 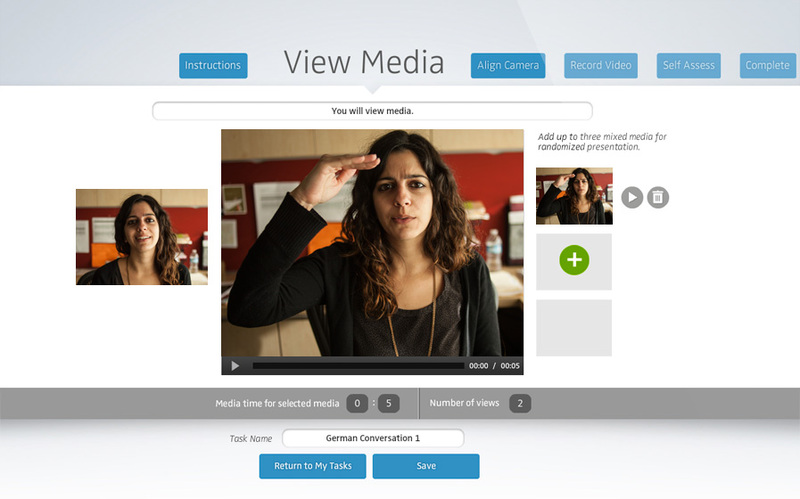 The Avenue Media Library is the hub of your task building efforts. 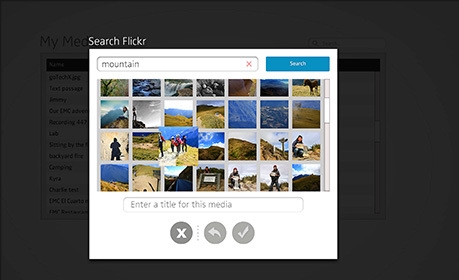 You can record a unique video tailored to your class, upload an image or video from your hard drive, or search using the integrated Flickr tool for Creative Commons images to use in your tasks. With the easy-to-use Avenue Task Builder, you can create customized assessments tailored to the next week, next day, or even next hour of your class. On average, tasks take fewer than 3 minutes to create and assign to all of your students. Edit the instructions for your students. 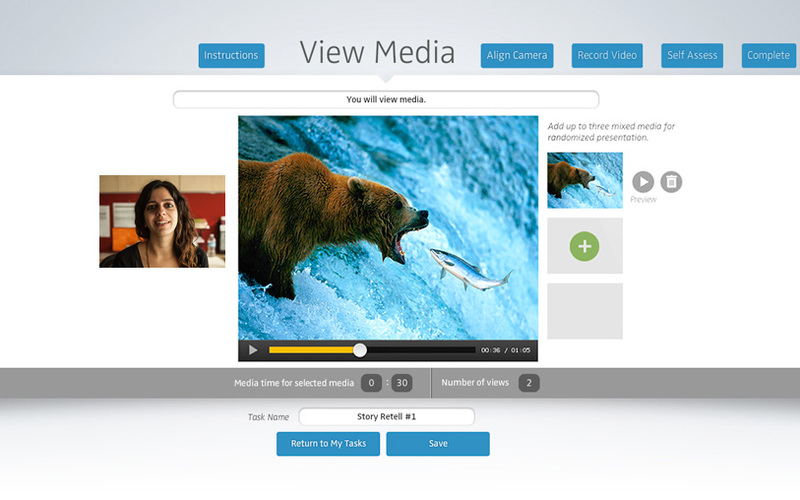 Select up to three different videos, images, or text from your Media Library to randomize presentation for mid-term, final, or even practice quizzes. 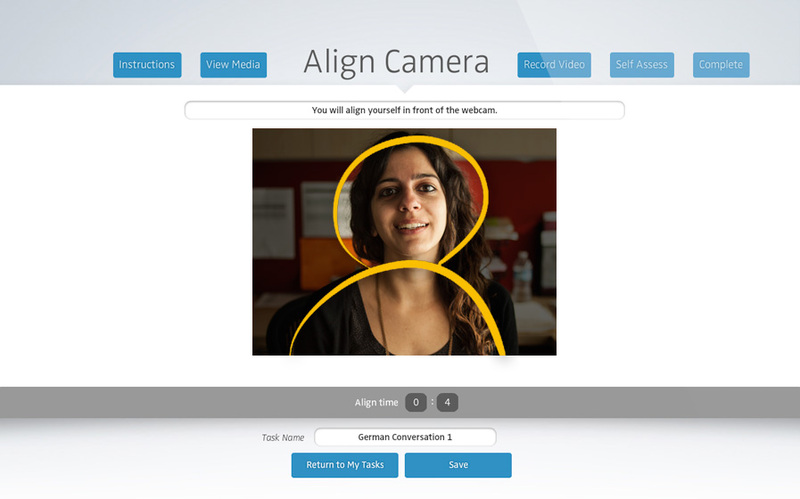 Adjust the amount of time your students need to align the camera. 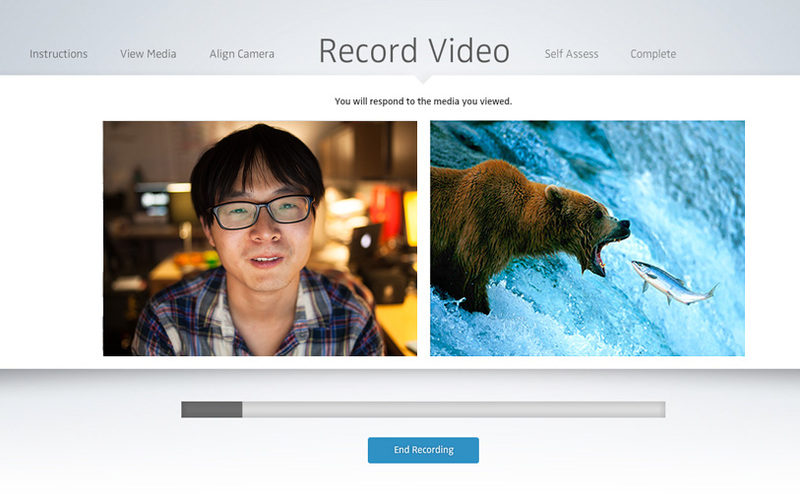 Set the number of tries your students have to record a video, the recording time, and if the media should be displayed while recording. Add sliders for student self-assessment. With the Assign tool, you can select a single student or drag across all of your classes to create customized tasks. Due dates can also be set and modified for each student or class. Assigning tasks has never been easier. 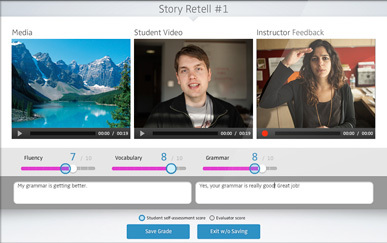 In addition to the custom scoring matrix you create when building your task, Avenue gives you the flexibility to record a tailored feedback video and provide qualitative text comments for each student. 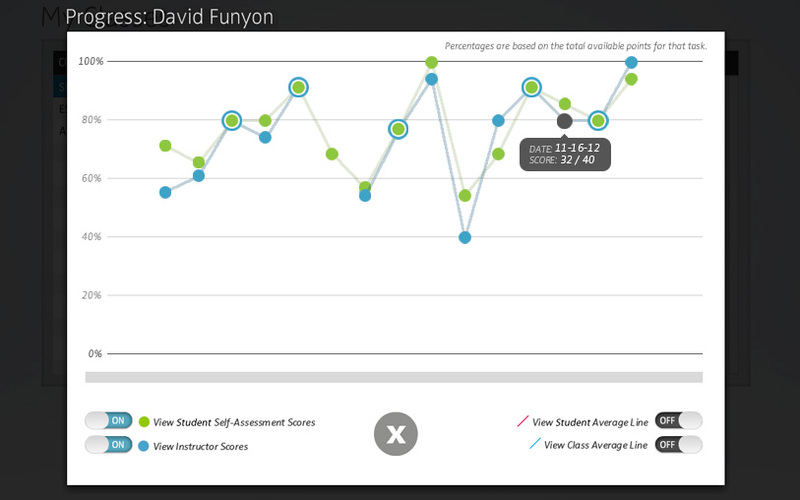 Interactive visualization tools clearly display student performance and progress, in addition to the ability to compare and contrast individual student data with an entire class. 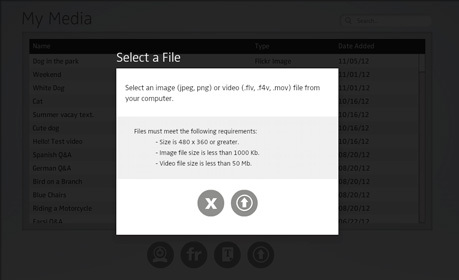 You can also export all individual and course performance data for external use. 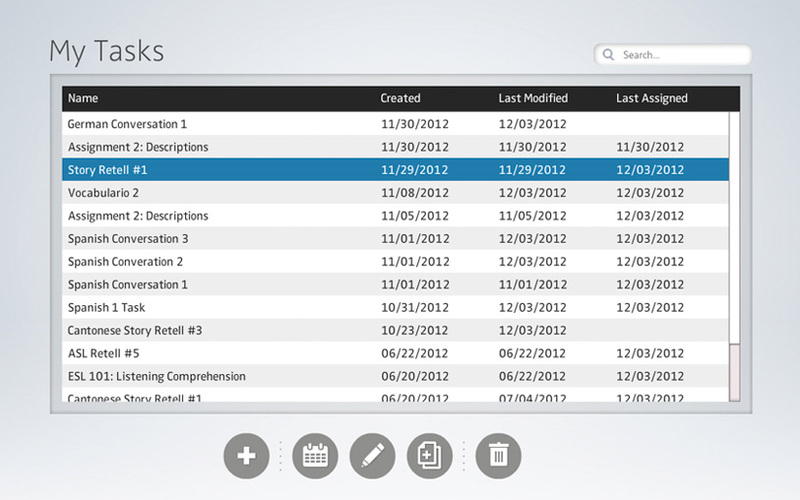 An integrated learner management system makes managing data across multiple courses easy. 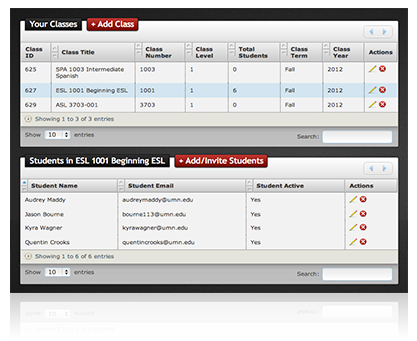 In addition, you can manually add or invite a list of students for increased ease-of-use. Once you assign a task, students receive an automated email with the task name and due date. 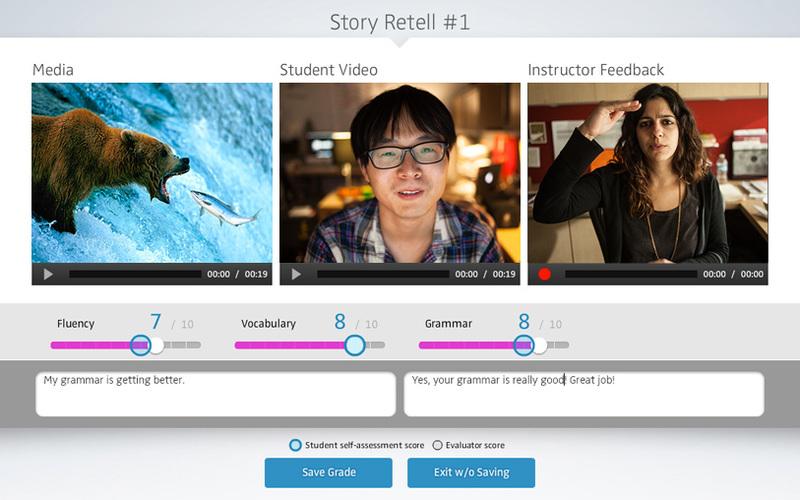 Using the custom instructions, media, and scoring matrix you created, students then complete your task. 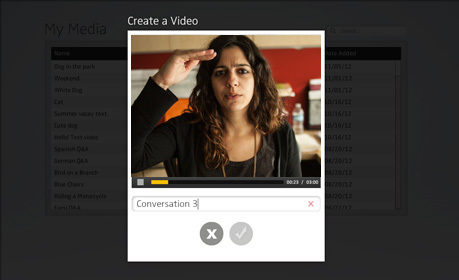 Once they have recorded their video, they have the opportunity to self-assess their performance and leave notes or questions for you. As a way to promote continuous reflection in their language development, students maintain an unlimited archive of all of their Avenue performances in every class. 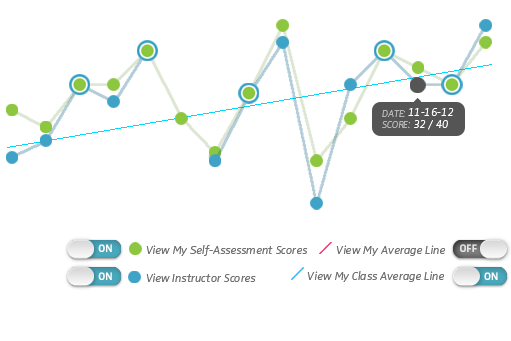 Students have the same visualization tools as you and can view their progress individually while also comparing it to their class (maintaining privacy). 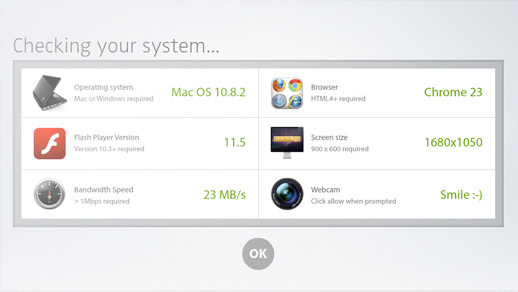 Before logging in, Avenue automatically checks your system to ensure optimal performance, then walks you through any items that need to be addressed. Based on years of integration in 1000s of K-12 and postsecondary classrooms, we have a comprehensive FAQ and info guide to help you with any questions that may arise. 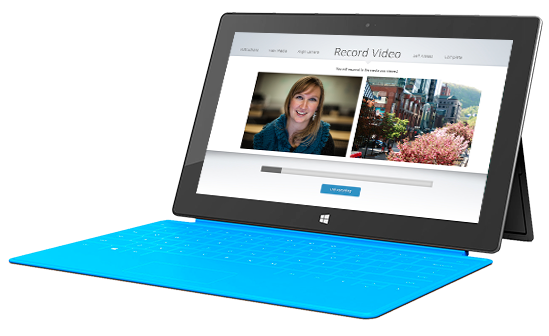 Avenue also has video walk-throughs on every screen to assist you if needed, as well as support accessible from anywhere in the system for individual support needs. We’ve got you covered. 1. General Terms and Conditions. 1.1 By accessing the Avenue Site (the "Site") or and using any features of the Site, including software and downloads (collectively, the "Services"), you will be agreeing to abide by these Terms of Service. These Terms of Service are a binding contract between you and Vidku, Inc. ("Avenue", "us," or "we"). You represent and warrant that you have all the right, power and authority necessary to enter into these Terms of Service, including granting us the rights and licenses granted below. 1.2 Only individuals who are not barred from accessing or using the Site under the laws of the United States or other countries including the country in which you are resident or from which you access or use the Site. 1.3 We may change these Terms of Service at any time, with or without prior notice to you. Changes will be effective immediately upon our posting them to the Site. You should review the Terms of Service each time you access the Site. You will be considered to have agreed to any change to these Terms of Service if you access the Site after the effect date of the change. 1.4 We may change, suspend or discontinue any aspect of the Site or the Service without prior notice to you. 2. Accessing the Site; Using the Services. 2.1 In order to access the Site or to use certain Services, you may be required to provide us information about yourself (such as identification or contact details) as part of the registration process. You agree to provide us accurate, non-misleading and up-to-date information. 2.2 Subject to these Terms of Service and your compliance, we will grant to access to the Site and use of the Services, including the right to transmit information ("Your Content") to us for the Site. You are responsible for Your Consent transmitted, displayed or stored on the Site. We may remove Your Consent from the Site or take other action as we deem necessary if Your Consent violates these Terms of Service. 2.3 We may provide you access to information of the Site that you did not provide us ("Other Content"), including advertisements. The person that transmitted the Other Consent to us is solely responsible for it. Other Content is the intellectual property of others and may be protected under applicable law. We have not granted you any rights or licenses under those intellectual property rights to reproduce, distribute, make a derivative work from, publicly display or publicly perform the Other Content. 2.4 In accessing the Site or using the Services, you may be exposed to information you find offensive, indecent or objectionable. You bear the risk that you may be so exposed. We are not responsible for any harm or damage arising out of your exposure to any such information. 2.6 You agree to comply with all our instructions related to your accessing the Site or using the Services, including those instructions set out in any robots.txt file present on the Site. 2.7 By transmitting information to us, you grant us and our employees, agents, and contractors a perpetual, irrevocable, world-wide, royalty-free, sublicensable, non-exclusive license to reproduce, distribute, make derivatives of, adapt, modify, translate, publish, publicly perform, and publicly display the information, including a license to transmit, store, distribute and publicly display such information on the Site. We may deliver the information you transmit to us to other companies, organizations or individuals with whom we have relationships for the provision of syndicated services, and to use the information in connection with providing those services. 2.8 In performing certain technical steps to provide the Services to our users, we may (a) transmit or distribute Your Content over various public networks and in various media; and (b) make such changes to Your Content as are necessary to conform and adapt it to the technical requirements of connecting networks, devices, services or media. 2.9 We may set an upper limit on the number of transmissions you may send or receive through the Site or on the amount of storage space used for the provision of any Services. 3. Security. 3.1 You are responsible for maintaining the confidentiality of passwords associated with any account you use to access the Site or and use the Services. 3.2 You will be solely responsible for all use and acts that occur on your account. We may suspend or terminate your account if use or activity on your account violates these Terms of Service. 3.3 If you become aware of any unauthorized use of your password or of your account, you must notify us immediately at ltml@umn.edu. 4. Proprietary rights. 4.1 We own all legal right, title and interest in and to the Site and the Services, including any intellectual property rights which subsist in the Services (whether those rights happen to be registered or not, and wherever in the world those rights may exist). You have no rights in the Site or the Services. You may not sublicense the rights granted you under these Terms of Service. 4.2 You agree not to disclose non-public, proprietary information we deliver to you, provided it is marked "trade secret" or with a similar designation, without our prior written consent. 4.3 You may not use any of our trade names, trademarks, service marks, logos, domain names, and other distinctive brand features. 5. Termination. 5.1 You may terminate your account at any time by notifying us at ltml@umn.edu. 5.2 We may terminate or suspend your account and with it your right to access the Site or use the Services, at any time. 5.3 As between you and us, sections 7 and 8 of these Terms of Service shall survive termination of your account. 6. Warranty Exclusions. 6.1 NOTHING IN THESE TERMS OF SERVICE EXCLUDES OR LIMITS OUR WARRANTY OR LIABILITY FOR LOSSES WHICH MAY NOT BE LAWFULLY EXCLUDED OR LIMITED BY APPLICABLE LAW. SOME JURISDICTIONS DO NOT ALLOW THE EXCLUSION OF CERTAIN WARRANTIES OR CONDITIONS OR THE LIMITATION OR EXCLUSION OF LIABILITY FOR LOSS OR DAMAGE CAUSED BY NEGLIGENCE, BREACH OF CONTRACT OR BREACH OF IMPLIED TERMS, OR INCIDENTAL OR CONSEQUENTIAL DAMAGES. ACCORDINGLY, ONLY THE LIMITATIONS WHICH ARE LAWFUL IN YOUR JURISDICTION WILL APPLY TO YOU AND OUR LIABILITY WILL BE LIMITED TO THE MAXIMUM EXTENT PERMITTED BY LAW. 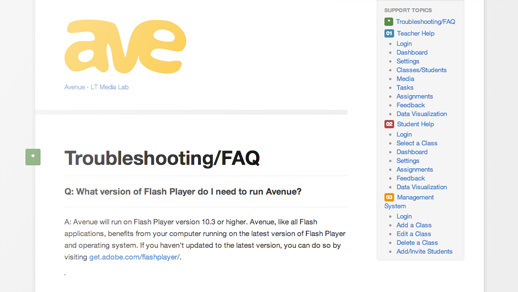 6.2 YOU USE THE SITE AND THE SERVICES AT YOUR SOLE RISK. THE SERVICES ARE PROVIDED "AS IS" AND "AS AVAILABLE." (a) YOUR USE OF THE SITE OR THE SERVICES WILL MEET YOUR REQUIREMENTS, (b) YOUR USE OF THE SITE OR THE SERVICES WILL BE UNINTERRUPTED, TIMELY, OR FREE FROM ERROR, (c) ANY INFORMATION OBTAINED BY YOU AS A RESULT OF YOUR USE OF THE SITE OR SERVICES WILL BE ACCURATE OR RELIABLE, OR (d) THAT DEFECTS IN THE SITE OR THE SERVICES WILL BE CORRECTED. 6.4 ANY MATERIAL YOU OBTAIN THROUGH THE USE OF THE SITE OR THE SERVICES IS DONE AT YOUR OWN DISCRETION AND RISK. WE ARE NOT RESPONSIBLE FOR ANY DAMAGE RESULTING FROM YOUR ACCESSING OR USING THE SITE OR SERVICE. 6.5 NO ADVICE OR INFORMATION, WHETHER ORAL OR WRITTEN, GIVEN TO YOU BY US SHALL CREATE ANY WARRANTY NOT EXPRESSLY STATED IN THESE TERMS OF SERVICE. 6.6 WE EXPRESSLY DISCLAIM ALL REPRESENTATIONS AND WARRANTIES OF ANY KIND, WHETHER EXPRESS OR IMPLIED, RELATED TO THE SITE OR THE SERVICE, INCLUDING, BUT NOT LIMITED TO, THE IMPLIED WARRANTIES OF MERCHANTABILITY, FITNESS FOR A PARTICULAR PURPOSE AND NON-INFRINGEMENT. (a) ANY DIRECT, INDIRECT, INCIDENTAL, SPECIAL, CONSEQUENTIAL OR EXEMPLARY DAMAGES, HOWEVER CAUSED AND UNDER ANY THEORY OF LIABILITY, INCLUDING, BUT NOT BE LIMITED TO, ANY LOSS OF PROFIT (WHETHER INCURRED DIRECTLY OR INDIRECTLY), ANY LOSS OF GOODWILL OR BUSINESS REPUTATION, ANY LOSS OF DATA SUFFERED, COST OF PROCUREMENT OF SUBSTITUTE GOODS OR SERVICES, OR OTHER INTANGIBLE LOSS; (b) ANY LOSS OR DAMAGE RELATED TO THE SITE OR THE SERVICE, INCLUDING, BUT NOT LIMITED TO, LOSS OR DAMAGE AS A RESULT OF: (i) ANY RELIANCE PLACED BY YOU ON THE COMPLETENESS, ACCURACY OR EXISTENCE OF ANY ADVERTISING, OR AS A RESULT OF ANY RELATIONSHIP OR TRANSACTION BETWEEN YOU AND ANY ADVERTISER OR SPONSOR WHOSE ADVERTISING APPEARS ON THE SERVICES; (ii) ANY CHANGES WHICH WE MAY MAKE TO THE SITE OR TO THE SERVICES, OR FOR ANY PERMANENT OR TEMPORARY CESSATION IN THE PROVISION OF THE SERVICES (OR ANY FEATURES WITHIN THE SERVICES); (iii) THE DELETION OF, CORRUPTION OF, OR FAILURE TO STORE, ANY CONTENT AND OTHER COMMUNICATIONS DATA MAINTAINED OR TRANSMITTED BY OR THROUGH YOUR USE OF THE SITE OR THE SERVICES; (iv) YOUR FAILURE TO PROVIDE US WITH ACCURATE ACCOUNT INFORMATION; OR (v) YOUR FAILURE TO KEEP YOUR PASSWORD OR ACCOUNT DETAILS SECURE AND CONFIDENTIAL. (c) THESE LIMITATIONS OF LIABILITY SHALL APPLY WHETHER OR WE HAVE BEEN ADVISED OF OR SHOULD HAVE BEEN AWARE OF THE POSSIBILITY OF ANY SUCH LOSSES ARISING. 8.1 We may deliver to you notices, including those regarding changes to the Terms of Services, by email, regular mail, or postings on the Site. 8.2 Our failure to exercise or enforce any legal right or remedy which we may have related to these Terms of will not waive any of our rights, claims or defenses. 8.3 These Terms of Service shall be governed by the laws of the state of Minnesota, without regard to its conflict of laws provisions. Any action to enforce these Terms of Service shall be brought in the state or federal courts in the state of Minnesota. You consent to the exclusive jurisdiction of the courts located within the county of Hennepin, Minnesota to resolve any legal matter arising under these Terms of Service.